Advanced Fiber Solutions is pleased to announce the release of a new line of micro OTDRs. They offer five models. Four singlemode versions with different dynamic ranges and one multimode version. The unit is powered via the PC USB port and requires no batteries or external power supply. The uOR-100 and uOR-200 Micro PC-Based OTDR measures the attenuation in optical fibers and splices, as well as the length and the distance to any event, such as a break in fiber link. The Micro OTDR is the perfect tool for the construction, maintenance and restoration of cable plants and also as an educational tool. The Micro OTDR is accurate enough for laboratory use but portable and rugged enough for field applications. 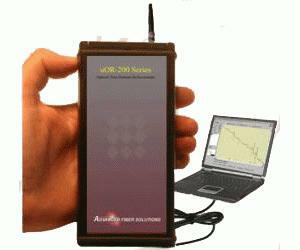 The Micro OTDR consists of the single, small rugged case; it is lightweight and has a low power consumption. The Micro OTDR is used in conjunction with a PC or Laptop with a USB interface, eliminating the need for batteries completely! The USB connection allows the Micro OTDR to be controlled from a laptop or PC and runs off of Windows 9x/NT/2000 and XP versions. The Micro OTDR software allows the user to determine all the neccessary characteristics of the Optical Fiber and is capable of displaying, storing, reading, printing and analyzing several traces at the same time.